My mom was introduced to this ... this ... thing today. I was feeding baby, so I wasn't really listening when she extolled its virtues to her sister. The gist was it's the "latest" happening thing among the aunties for a health / beauty reason. The packaging was the holographic type you see on high quality pirated DVDs, so I thought it was some expensive product from France or something. Till I decided to read it. I nearly snorted Coke Light out my nose. I asked my mom between sputters why the heck she bought this. It couldn't be for what I think it's for. And aunties couldn't be clamoring over this for why I think they are. She couldn't really explain, but I'm guessing it's a literal translation from Chinese and it refers to rough skin (i.e. horny?!) and this lotion's supposed to be great for smoothing it out. It appears the manufacturers didn't think an ingredient listing was all that important, so they stopped at "grape extract distillate" and abbreviated the rest to " ...etc ...". I also love how clear the instructions are. "Days for sub-two, first shall-face wetness, and wield the product gently knead". And if course, if it "into eyeball", you should make sure you're not naked because "sonly washing for clear water" is required "if immodesty". In China, the English used on road signs, restaurants, roadworks etc... may be horrible, but at least you can understand what they're trying to say. 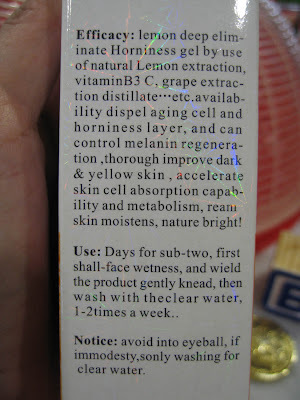 On this product, it's like the brand manager just Googled random English words from different beauty products and pasted them on without any thought to sentence structure, grammar or comprehension. I had to find out where this product was made. What's a Stanchion Time?!? Did they name the company "America" just to give it the impression of being made in America?!? Is that address the manufacturer's address or distributor's? It could be the address of the brand manager's psycho ex-girlfriend ffs!! 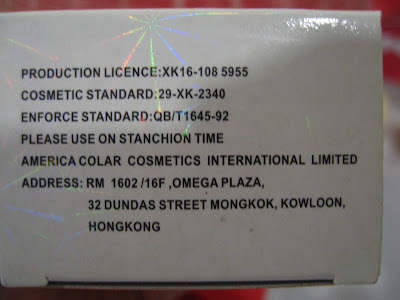 Legally, you MUST have the manufacturer name, address and country of origin clearly stated on the packaging - or the product just can't get through customs to be sold here. I've personally experienced how strict our Malaysian regulations are, when I was in Marketing. But none of it is here. I've convinced my mom to return this. Her horniness is fine the way it is. This has got to be one of the best entries ever! 80% credit to you, 8% to the manufacturer and 12% to the author, copyrighter, marketing genius of the product.